Mr. Frank L. Kodelya was the founder and first Captain of the SS Samuel Parker Chapter. He was born and raised in St. Louis, Missouri, but his heritage was from the province of Slovene in Austria. Frank joined the merchant marine when he was 17. At that time, World War II was raging and he served for three years. When the Korean Conflict began, Frank was drafted into the Army. He went to Officer Candidate School at Fort Sill, Oklahoma and finished as a 2nd lieutenant. Two weeks before he left for Korea, he married Jo. While he was gone, their first child was born. Frank was on the front line in Korea serving as a forward observer. When the conflict was over he remained in the active duty reserves and became a colonel. He retired from the reserves at age 50. He is in the Fort Sill "Hall of Fame" as OCS (Artillery). By profession, he was a salesman of biomedical Holter monitor systems. The family moved to Arlington, Texas where Frank was promoted to Vice President of his company. While he was in Texas, he joined a merchant marine chapter in Houston. Arlington is near Dallas/Fort Worth and Houston is much nearer the Gulf of Mexico. He started a chapter in Dallas -- the SS Steven Hopkins Chapter. The family lived in Texas for ten years. When Frank retired from sales, they moved back to St. Louis. Never wanting to be too far from his merchant marine brothers, he started the SS Samuel Parker Chapter in St. Louis in 1995. When the chapter was started, there were only ten members, but that number has grown to almost 100. 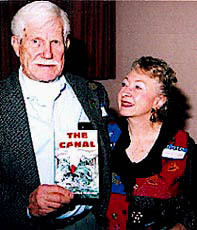 Frank was the captain of the chapter until his death in 1997. The members of the chapter are greatly indebted to Frank for bringing this brotherhood to the St. Louis area. The Liberty Ship Samuel Parker was the first merchant vessel cited as a "Gallant Ship." The War Shipping Administration made this award to merchantmen that distinguished themselves in action. This award was presented to Commander A.K. Natland, USMS, by Vice Admiral Emory S. Land, War Shipping Administrator during a ceremony at a Brooklyn pier in 1945. In 1943, the Samuel Parker carried troops and military supplies to and from Mediterranean ports. German bombers and submarines frequently attacked the ship for the six months she was there. She carried British troops and cargo from Alexandria to Tripoli during the early stages of the Montgomery-Rommel battles in North Africa. The ship was also attacked during the Sicilian engagement. At the conclusion of her six months in the Mediterranean, when she was headed home, she had 140 holes in her hull and superstructure. The Samuel Parker Chapter has been instrumental in bringing to St. Louis a memorial to honor merchant marine and Armed Guard veterans who gave their lives in service. This memorial was dedicated on November 11, 1998. It is made of granite and is located near the memorial to the US Navy WAVES in Jefferson Barracks National Cemetery. A monument dedicated to all merchant marine and armed guard veterans living and deceased was erected in 1999. The US Navy League also participated in this acquisition. The US Navy donated the anchor from the aircraft carrier USS Langley to our Chapter. It was transported to St. Louis on a flatbed trailer from Florida. Mike Congardi and Joe Congiardo prepared the anchor for placement at the Soldiers Memorial located in Downtown St. Louis. 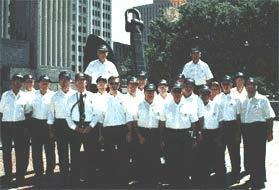 The formal dedication ceremony was held on July 5, 1999. Many dignitaries from the St. Louis area attended, including Mayor Clarence Harmon. Members of the merchant marine and Armed Guard veterans were present at the ceremony. Eduardo Bendex, an American Engineer born in Panama, is chosen to construct a new canal to replace the rapidly decaying Panama Canal. Bendex picks a plan approved by Teddy Roosevelt in 1890 for a six-lock canal on the border of Nicaragua. But a solitary madman, intent on revenge against his family's killers, penetrates safeguards and puts hundreds of people, including Bendex in danger. THE CANAL careens through the jungles of Costa Rica and the deadly streets of Panama City showing how mismanagement can bring disaster to the most carefully guarded waterway in the world. For the purchase price of $15.00 (mailed postpaid) you can acquire this 216-page story, by sending your check to Samuel Parker Chapter, P.O. Box 20107, St. Louis, MO. 63123. ($1.00 from each sale will be donated to the History Gallery, U.S. Merchant Marine Academy Museum, Kings Point, N. Y.) For inquiries, feel free to contact the Author at "canalbill@aol.com." 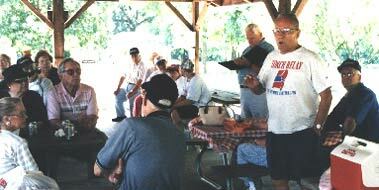 Each year, the Chapter sponsors two picnics for the members, one held in June the other in September. We reserve a pavilion at Jefferson Barracks Park and bar-b-que. Family members and friends are invited. The smell of open pit bar-b-que increases appetites to a feverish level. The ladies bring scrumptious side dishes as well as desserts. The weather is hot, but no one seems to mind. This year we had such a smoky fire, the fire department came thinking they were going to put out a fire only to find us all laughing and having a wonderful time. The holiday season brings another time for meeting with good friends. The chapter chooses a restaurant or banquet hall for the Christmas Party. It is a very festive occasion. Everyone dresses up in the colors of the season. For dinner, we have all the trimmings ­ turkey, dressing, sweet potatoes, everything that makes the day warm and cozy. It is a time for being together with friends. The SS Samuel Parker Chapter has approximately 100 members. Every merchant marine has tales to tell about his travels at sea. As a way to share these stores with everyone, this section of our webpage will spotlight several members of the chapter each month. Please return often to read these interesting stories ­ you may read about a mate you served with. It was August 1944, I had just turned 17 that month. After my training at Catalina Island, I was sent to San Francisco where I shipped out on the SS Czechoslovakia Victory. The hatches were full and our decks were loaded down with military equipment. The destination was unknown to the crew, but code name "DUVA" was printed on each piece of deckcargo. Our first stop was Pearl Harbor, then on to somewhere in the Pacific. One very moonlit night I was at the helm on the 8 to 12 watch. It was close to midnight when a Japanese aircraft flew so close to our ship that you could see the pilot. The third mate came into the wheelhouse and told me the plane had flown so close he could have dropped a bomb down our stack. When I asked why he didn't, the mate replied, 'He was taking pictures of our deck cargo in order to determine our destination.' A few days later I head Tokyo Rose on the radio. She said, 'We know where you are going and we'll be waiting for you.' "
The next stop was Guam, then to Eniwetok to join a huge convoy for Leyte in the Philippines. The return voyage was not without incident. Captain, Samuel Parker Chapter, St. Louis, Mo. As a Cadet-Midshipman USMM-USNR, I recall my first ship, the Council Bluffs Victory, sailing out of San Francisco in Early November, 1945. As I stood on the fantail watching the city lights fad into the distance, I wondered if I would ever see them again. We were hauling a shipload of high octane aviation gas in 55 gallon drums and our destination was China and Okinawa. That evening with the seas spraying green water over the bow, I learned how to swallow my first fresh oysters on the half shell, and believe it or not they stayed down in those very rough seas. Fifteen days later, after enduring a typhoon in the seas near Japan, we landed at Buckner Bay in Okinawa (before our conquering this island it had a Japanese name). We couldn't give gas away there because the other ships had Budweiser on board which was more desirable than gasoline. From there it was on to Tientsin, China, then Tsingtao. In all cases they wanted Budweiser (which was green and not aged) rather than our gasoline. We saw many floating mines dragging their chains dangerously close to our ship. We went ashore at Tsingtao in a harbor boat for some R & R. I was able to catch a ride up a hill in a rickshaw in exchange for a chocolate bar and two Chesterfields, but when I came down that hill the harbor was too rough for us to get out to our ship. Since martial law was in effect, the Shore Patrol invited us to spend the night in the brig (as guests). The next morning the prisoners were all exercising at 5 bells, but we kept sleeping. We returned to our ship and left for Shanghai. We encountered more mines in these waters and also saw dead bodies floating down the Wangpoo. However, Shanghai was a beautiful city, even more so now. We were finally able to unload some of that aviation gas, but only because we made it there before the Budweiser ship made it to port. Yes, this Pacific Theater was interesting. Six months later we returned to the good old USA." In late 1946, I shipped as an AB aboard the M.I.T. Victory from Brooklyn, N.Y. The Council Bluffs Victory was in mothballs nearby. Our destination on the Army Transport was Bremerhaven, Germany to haul troops home. The devastation to the city was immense from our ceaseless bombings. We picked up the troops, but their accommodations were less than stellar. They were bunkered 5 deep in the smelly holds below. The rough North Atlantic seas made many of the Army boys toss their cookies, always on the windward side of the ship. It was our job to continually hose this area down. You'd think they'd get the idea on which side of the ship would be better for tossing their cookies. It was mighty good seeing the "Lady of Liberty" when we arrived back in the USA. "In the spring of 1946, I was an ordinary seaman aboard a WWI hog islander, the SS Jacob Luckenbach. I boarded in Brooklyn and traveled up the east coast and then down the St. Lawrence to Three Rivers, Canada where we took on nearly a full load of oats. We went on to Montreal and completed our loading with some dry stores which included shoes and clothing, our entire load bound for those starving in Europe." "Although we were in Montreal for only a few hours, those members of the crew not working were allowed ashore, but no further than the closest bar. After a time, they were hustled back to the ship. In the late afternoon it was time to head for the Atlantic. We left port with a pilot and a junior pilot, who I don't believe were in any better shape than the crew." "I was standby on the midnight to 4 AM watch. I went below and made a pot of coffee. On my way up the ladder to the wheel house, the ship gave a sudden lurch and I found myself climbing the ladder at a much steeper angle." "Upon reaching the wheel house, I noticed the mate had a glass of water on a flat surface checking the pitch of the ship. He told me to wake the captain and to inform him that 'I think we have run aground.' "
"I knocked on the captain's door. There was no response. I opened the unlocked door and saw a light coming from the private head in his quarters. Peeking through the door, I saw a rather feeble, 80 year old man trapped on his toilet leaning against the bulkhead at a steep angle. Following orders, this 19 year old sailor crisply said, 'Captain, sir, the mate told me to inform you that he thinks we have run aground.' His reply was 'what the hell does he mean; he thinks we've run aground? Get me down from here!' "
"That was only the first of many crazy incidents we experienced on SS Jacob Luckenbach from Brooklyn to Trieste and back to Galveston, Texas."